← Episode 97 – Dave the Wave! I had a meeting recently about some behaviour issues related to students using iPads. These meetings are not unusual for me, or anyone who manages technology. For that matter, this is common for anyone working in education. Students have “things” and “do things”. Everyone has issues with behaviour. I encouraged them to focus on statements that do not connect to a “thing” but rather to the behaviour or action. My reasoning is that if the school connects non-negotiable policies to an object, when that object changes the reinforcement may also change. People associate logic and reasoning to objects. In many NLP (Neuro Linguistic Programming) models, objects are used to anchor memories and feelings. One does not have to be a master of neuroscience to acknowledge that by not setting an anchor, board consistency is more likely to remain when change occurs. 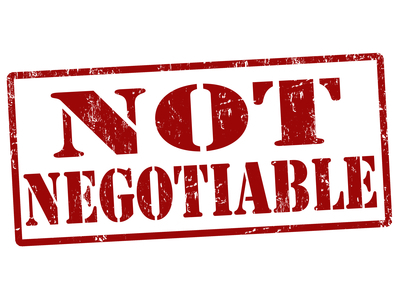 I am certain everyone understands the concept of a non-negotiable statement or practice. However, not everything can be a non-negotiable, and I do not see the need for many of them. These statements (which is the context I am focusing on) should be universal within the school and easily applied without interpretation. The application by a teacher merely moves the students and situation to another level of discussion. A non-negotiable does not need to result in a severe action, but some action must be taken. I believe all schools running any type of 1-to-1 device program should have these statements and have them clearly posted and communicated to the entire community. You have been warned (X – Number of Times), now, (Action). Personal privacy is not a flexible issue. (Action). Unauthorized content, or use of unauthorized content, was clearly explained. (Action). Everything here (define) indicates plagiarism or academic dishonesty. (Action). This appears to be a potential risk or threat to personal safety. (Action). The power in these statements is that there is no discussion. Once communicated, the student will immediately move to the action phase. The behaviour is being addresses, without mentioning the “how and what” involved. Those details may be discussed later after the student has been moved to the next level of action. They need to know what they have done is not only against the rules, but something the teacher simply refuses to discuss alone. This entry was posted in Helpful Tips, Learning 2.011, Opinion and tagged 1-to-1, Behavior, Behaviour, Devices, NonNegotaibles. Bookmark the permalink.